2nd Cranked up main tower and 50MHz 4 x 8 array after a few weeks "sleeping" in the field - system tested with 10 EU DXCCs on MSK144 and first two 50MHz EME QSOs of the year. 7th Tried RSGB 144MHz FM activity contest - received comments Contest?FM? is there no escape from contests? 9th 144MHz EME HB9Q and SP4KM for new DXCCs. 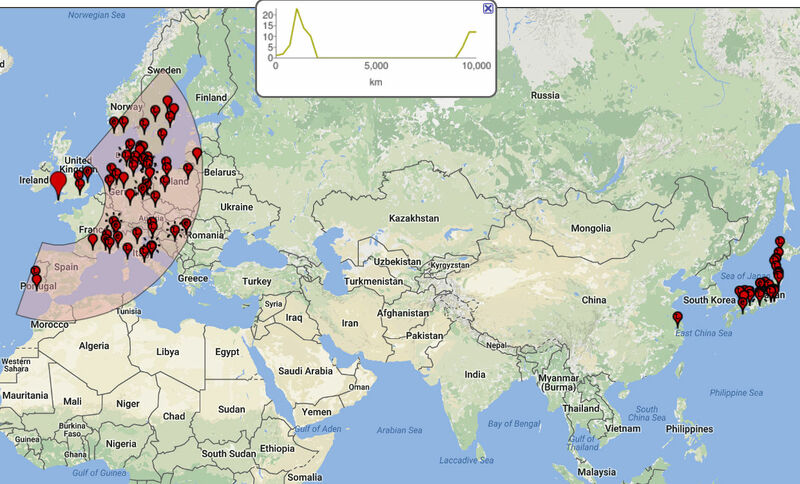 9 Nordic stations on JT6m in 50MHz NAC. Strong winds and storms - antennas tied down for survival! 4th Back to 50MHz EME:-) 6 QSOs incl 4O6AH for new init #167 and new EME DXCC and KD7DCR new init #168. 20th: 1st sked with JT1CO / JT5MA on EME heard but not worked:-( Quite a spectacular day with very early KP4 running through to weak NA from EI western UK right op to 1am local! 21st Intense 1 and 2 hop Es around EU plus an interesting 1 hour skew opening late afternoon to KP4 VP9 towards W4. 24th Worked JT5DX on EME for EME DXCC #75 and new field/square . TNX Kresimir and all the team in JT. JT5DX had 1st QSO with W7GJ on their moonrise and then UR0MC, G8BCG, K2ZD, S59A on moonset. Way to go! 25th KP4 in on JT65 from early afternoon followed by an evening of weak and variable JT65 KP4, YV, J39, PV8 and briefly YS1 (BCG working on control systems so swl only). 28th A bit of fun in the afternoon RSGB 70MHz Cumulative. G, GW, EI, GI, GM, PA, DL, OK and ODX 9A. 30th Another morning of SSSP but mainly JA-Med. Worked YI1SAL at 08:30z for DXCC #238 new square and new field:-). Also E44WE and 9K2OD at 59+ for a couple of hours. Intense multi-hop Es out to 9K all morning with Med still working JAs and BY at 16:00z! [1629 BA4SI (pm01) 50084.0 pe1czg] Also open on 70MHz and 144MHz. LZ1AG and OJ0JR for new DXCC#32 & #33 on 4m. Band still wide open to EU when I gave up at 23:00z! 31st 06:30z already open to JA! SSSP shortened back into EU - but SV - JA path still open 15:00z. PV8DX all alone on JT65 and CW for over an hour mid evening. Interesting backscatter from SW on GM JT65 sigs. 1st JAs to start the day, widespread multi hop Es across EU and then from mid afternoon Carib + a few NA stations on JT65, CW, SSB. Notable QSOs HI8PLE, HI8JSG, HI8SMX, HI3T, KP4(lots), KP2, ZF1, HH2, CO8 and to end the evening another hop into TI5/N5BEK Band still open across EU and to Carib at 23:00z - my eyes closed. 4M & 2m also open across EU - 55 QSOs on 4m for a few new #. 3rd 06:30z -already hearing JAs and JA open EU and KL7/W7 at same time! 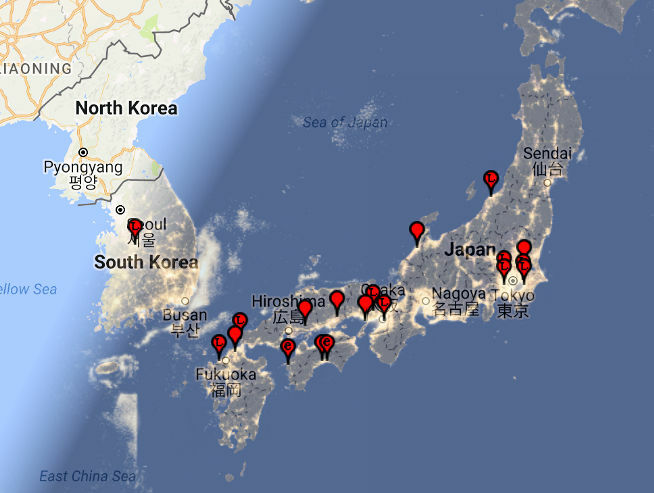 20 JAs (Japan) and 1 DS3 (Korea) worked by 12:00z. Click on image for locations distribution. Was also called by K4MM with my beam on JA - turned to Florida - nada - reflection / backscatter? IO70 was a black hole in the evening - just one small burst from FK8OG. 4th Widespread Es across EU then mid West and West Coast US early evening with fall back to East coast later. 5th Another morning full of JAs - amazing! Map and distance profile is interesting. The above and a few days holiday has kept me out of the unbelievable SSSP openings this week. Congrats to the many who must have got JA and USA West coast new ones over the past few days. 15th Strong multi hop Es all day out to mid East. Early evening appearance of many XEs and OA4 on JT65 plus of course mid West USA and north to VE5. 18th Condx good - beach and BBQ better! 19th Some morning JAs and BS BV and BY but weak here. Es all day. Evening YV5 PV8 9Y ZF + usual Caribs then W (focus on W8), VE gave up ad 00:15z with band still open. 20th As above plus TZ4AM - I was at the beach! Opening to US was much weaker and patchier in UK/EI. 22nd Even quieter with just whispers of 9K and USA - somebody switched of the prop as Solstice? 25th Great early morning opening TF over the pole to JA. BCG not QRV. 28th No SSSP to east but a good afternoon and early evening of low level NA Es. 30th Nice late evening opening to Carib again. 20th-29th not QRV - see DX Maps for band activity. 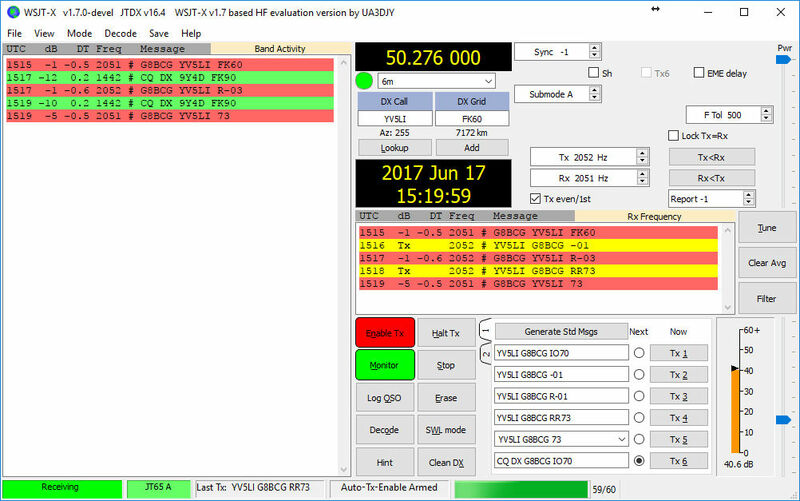 1st-19th active with single yagi and QRP mainly on FT8 - see DX Maps for band activity. 20th VP8EME for EME DXCC #77 single yagi to single yagi on our moonset - thanks Mario. 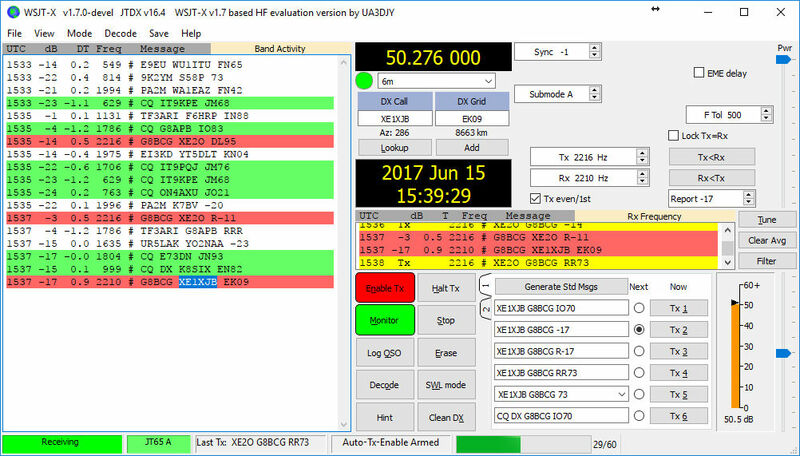 1st-13th - continued with FT8 and big array rebuild. 14th Got temporary H Frame and 4 * 8in the air (just!) to try fot Lance. 16th Shiny new Extra Heavy Duty H-Frame from InnovAntennas just arrived. 6th - 8th Lance seems to have moved the 50.190 beacon to VK9X :-) 8th Great sigs from Lance with moon at 15deg and my array parked at 090az0el!! 14th Worked 3DA0MB in Swaziland for 50MHz EME initial # 187. With my single 12el they are a bit weak on 144MHz and boy what a pileup in the first few hours - we'll see what the next few days bring. 17th Afternoon TEP returns! 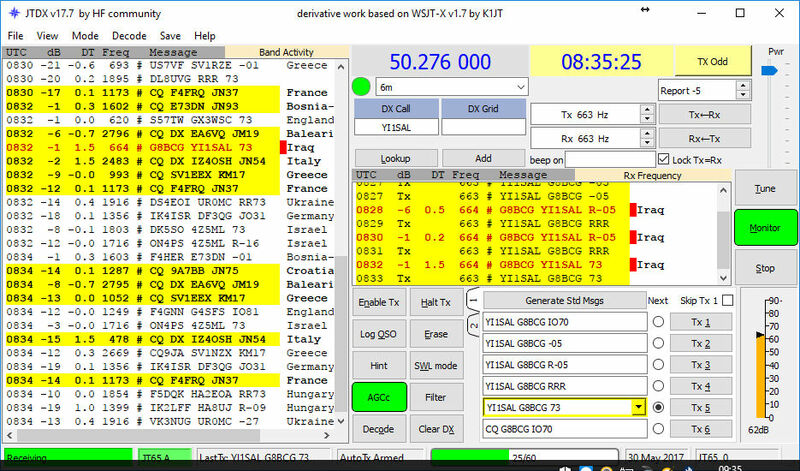 ZD7BG widely worked across EU for over 2 hours. Despite my array being on the ground facing West for Storm Ophelia they were audible here just before they decided to go QRT. 19th Around midday I was testing an RTL Dongle and Lenovo Tablet for noise tracking - excellent. And what a surprise I got - An International Space Station overflight with Italian Astronaut and Radio Ham Paolo Nespoli operating OR4ISS answering questions for school kids in Ireland via the ARISS on 145.800FM. Not bad for an RTL SDR Dongle with SDR Touch and a 1/4 whip. ARISS recording here. 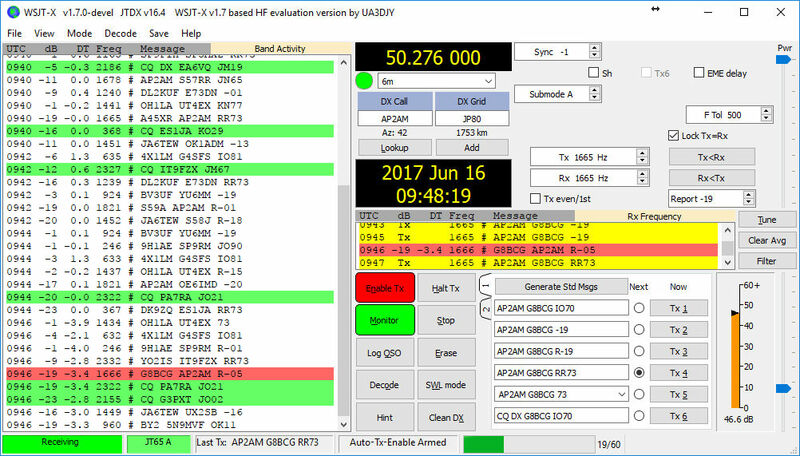 22nd Un tethered the big array for the RSGB AFS 50Mhz Contest (AKA Little Britain Contest) Stayed interested for just over 1 hour and handed out my PostCode city prefix just over 50 times including 2 on JT6M. 10 countries worked - ODX was Nicolas TY2AC on A1SM mode at around 22wpm:-) Though CW pre-dates WSJT by a Century or so it's still pretty effective for weak signals! 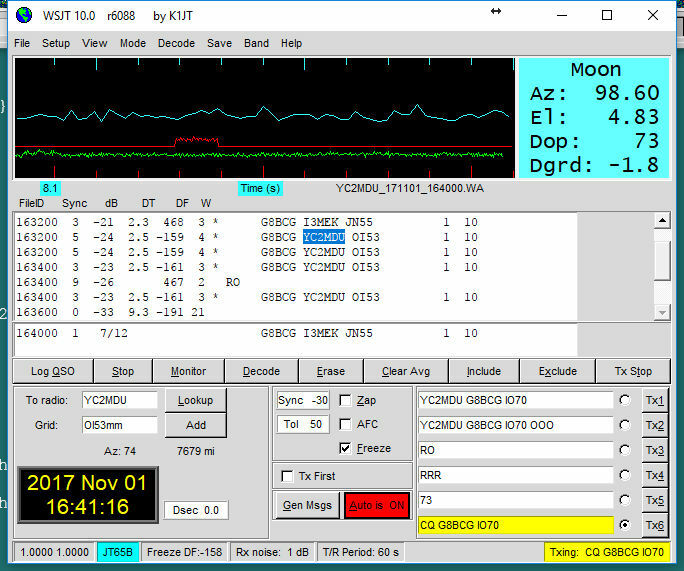 5th Woo Hoo moonset: V31EME for 144MHz DXCC # 50 and new init 92 - first call on my MS GG - not bad for a single 12el LFA. 12th An hour on the UK 70cm UKAC - everyone is deaf!! Well, probably a bit of fake news as I was only running 10w. Thanks to M1MHZ who came back first call despite being quite weak here. Ditto M0MDY. Others were not so easy / impossible even though running up to s9 at times and CQing endlessly. Hopefully I will complete my big SSPA switching early next year. 14th 50MHz array luffed over and tied down beaming East but decided to give some points away in the 50MHz Nordic/UKAC - Kept it to 400w as 2 of the 4 8el OpDes yagis were only 1m agl / 50cm asl (above sheep level :-). A few of the usual suspects on SSB plus PA DL OK I and 6 OZs! 15th Looks like the southern hemisphere has truly "discovered" SSSP this year - VK7 to ZS and LU next? 50mhz Congrats to Javier Pons Estel and all the fortunate ones. This is a true bonus of MGM and in particular FT8 on 6m in creating interest and activity at ALL times!! 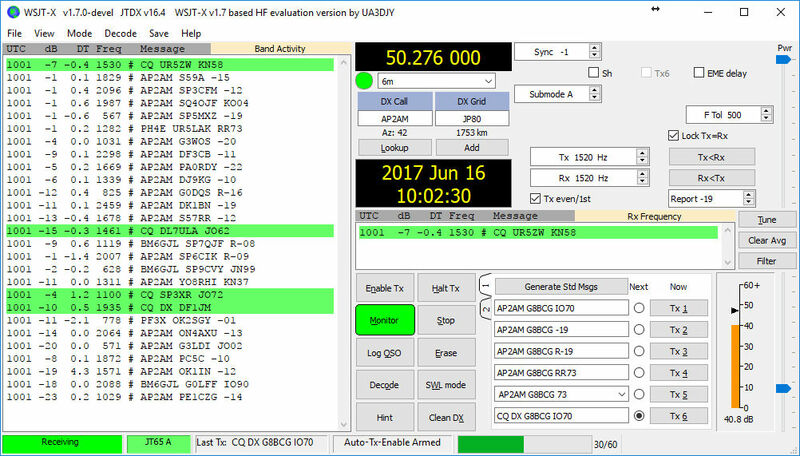 From Javi LU5FF: "in the opening of yesterday I tried to pass stations in CW and FT8 unfortunately the signals were so weak that I could not get a letter, same step in FT8 was not enough to decode on the other hand in the JT65 mode the decoding was fantastic" JT65 IS STILL THE BEST FOR REALLY WEAK SIGNALS!! 19th the newly discovered southern hemisphere SSSP continues to provide VK/ZL with QSOs to the East - but the evening path to the West remains undiscovered as yet. See 50MHz DX Maps for a daily overview of global activity.